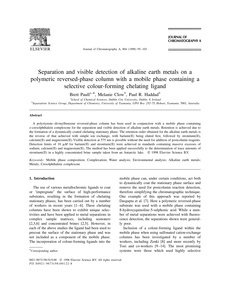 A polystyrene–divinylbenzene reversed-phase column has been used in conjunction with a mobile phase containing o-cresolphthalein complexone for the separation and visible detection of alkaline earth metals. Retention is achieved due to the formation of a dynamically coated chelating stationary phase. The retention order obtained for the alkaline earth metals is the reverse of that achieved with simple ion exchange, with barium(II) being eluted first, followed by strontium(II), calcium(II) and magnesium(II). Visible detection at 575 nm is possible without the need for addition of postcolumn reagents. Detection limits of 10 μM for barium(II) and strontium(II) were achieved in standards containing massive excesses of sodium, calcium(II) and magnesium(II). The method has been applied successfully to the determination of trace amounts of strontium(II) in a highly concentrated brine sample taken from an Antarctic lake.